I met Malachi on his way to pick up the train going to work. The first thing I noticed about him was his large disc earrings and bone necklace and as he was walking towards me I stopped him and complimented him on those. I explained my project and asked if I could make a portrait of him, and he was happy to help me out. I noticed that he had an e-cigarette vapor device he was holding in his hand. I had explained I’ve seen a lot of people with these lately but that I’ve never actually seen one close up. I asked if he could show me how it worked... and told him I grew up in the 80’s and was a non-smoker and was clueless to these devices. He put a drop or two in the e-cig device and gave it a puff and blew out a large vapor plume. I didn’t notice any smoke smell like traditional cigarette smoke. In fact it didn’t smell at all and looked less harmful than traditional cigarettes. I told him that my parents were both smokers and how much I disliked cigarettes and the smoke... he laughed and agreed. Malachi currently lives in the Dinkytown area near the U of MN. He said he didn’t really care for the scene there as it was always noisy and full of rowdy students, and wasn’t sure how much longer he would be living in that area. 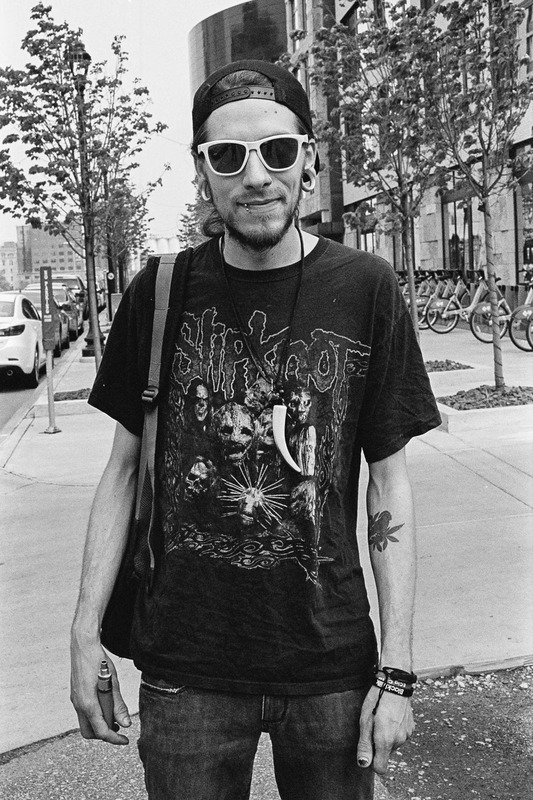 I had noticed his shirt and the band Slipknot which I’ve heard of before. I told him I grew up with Judas Priest and Iron Maiden but never listed to slipknot... but I am pretty sure that dated me again... another good laugh we had. Malachi was fun to meet and talk with, and we had a good couple of laughs, not to mention him helping expand my horizons. Cheers!